Well, ladies, gentlemen. Today I bring you something that the second you get home after work/school/University etc, you will go to your kitchen cupboard, rustle up these few ingredients and thank me when it's done. There are rumours that this lasts no longer than a day in some households. This is Salted. Chocolate. Peanut Butter. Fudge. 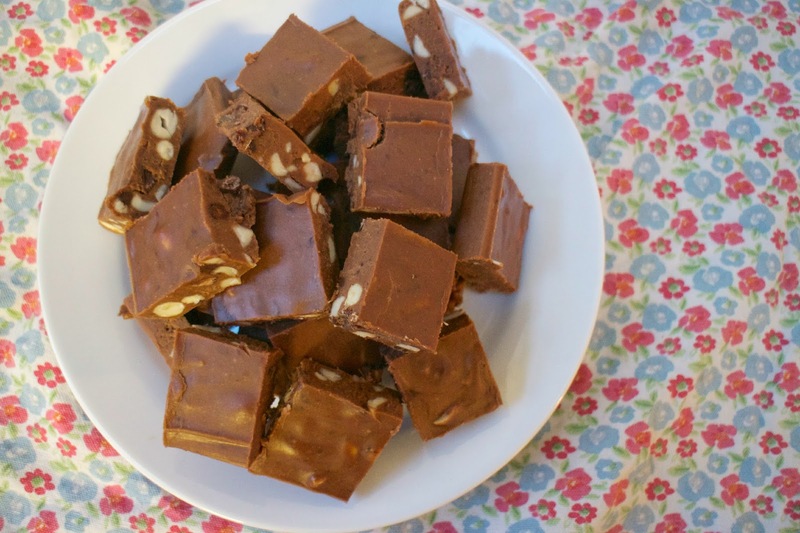 Now, I must, must, MUST give full credit to the wonderful Laura from Wholeheartedly Healthy for this recipe as she originally posted a recipe for Salted Almond Butter Fudge that I really must make. Laura - you're a genius, so thank you! I decided I'd tweak it considering one of my favourite combinations is chocolate and peanut butter, plus I adore the combination of salty and sweet. If this had a salted caramel layer I think I'd be living off it for life. This does contain a lot of coconut based products - coconut oil and coconut milk so if you're not a coconut fan, I'd personally omit the coconut oil for the best butter you can get hold of. I'm not a great coconut fan myself, though found this was fine for me, though more peanut butter could have potentially 'helped' to mask the subtle coconut taste. Nevertheless, I simply love this recipe. It uses simple, clean ingredients that you're bound to have in your kitchen cupboards. Although this is rather calorific, this is a heck of a lot better than something processed. Plus you can easily adapt this recipe with any sort of nut butter and flavours. It's also easy to cut this recipe in half or double it. 2. Add the peanut butter, coconut milk and maple syrup. Mix this all together until it's a a light buttery, fudge-y colour. Let me know if you make this recipe, I'd love to hear your thoughts or if you make any adaptations. Also, if you do make it, please go over to Laura's blog and say thanks for her genius mind! Don't forget to subscribe to my YouTube channel if you enjoyed the video aaaand if you're new to the blog, follow on Bloglovin'! Oh my god this looks AMAZING. Just stumbled across your blog and I love it!